5 Rare Dog Breeds You’ve Never Heard Of (Part 1) – ComeHereBoy! The FCI is basically the international version of the AKC. It’s a world organization that promotes the welfare of canines, as well as offering events and shows. Within the FCI, there are some 330+ dog breeds recognized, far more than the AKC. It turns out, there are a bunch of breeds of dogs that are really cool and that you’ve probably never heard of! 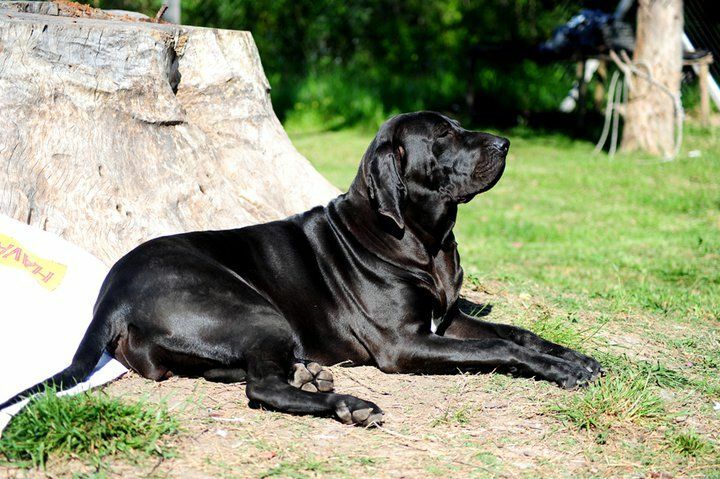 Here we’ve listed one cool dog breed from 5 of the categories of the FCI. This dog is one of my absolute favorite dog breeds to fantasize about owning. 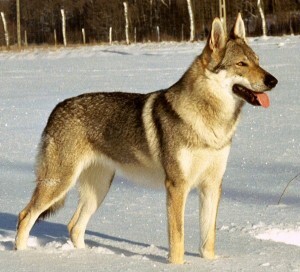 They look just like a wolf, but they are very much more domesticated than a wolf-dog hybrid. They are a bit different temperamentally than your regular dog and do require food motivation to train. They are a diffuse mix of Wolves and German Shepherds. Interestingly enough, they cannot bark. 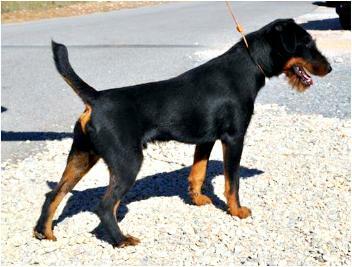 The German Hunting Terrier is a wiry haired terrier with great energy. They are busy and need a job to do as well as a lot of exercise. Their wiry hair sheds water and dirt while out in the field. The history behind the breed is kind of bizarre as the man who developed them wanted a black and tan terrier, but the only black and tan dogs he had weren’t great hunters. So he had to do some breeding experiments to get the right color and good hunting instinct, then he bred for the wiry coat too (it just comes across as sort of backwards.) Sadly, any dog in his kennels that didn’t conform to the standard he set were shot. At one point, he had over 700 dogs in his kennels (he didn’t want anyone else to have any while he was developing them.) They are usually used for hunting foxes to ground. 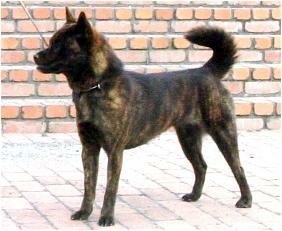 The Kai is a neat looking primitive dog that’s quite rare. They are born with different markings and colors, but over the years they turn this beautiful dark brindle color. As with many primitive dogs, the Kai needs to be well socialized as a pup. They have a strong hunting instinct and cannot be trusted very well off-lead. They are actually not very large, only getting up to about 40 lbs. They also have a double coat that blows twice a year, which for some, is nice. It’s considered to be the most ancient and pure of dog breeds in Japan. 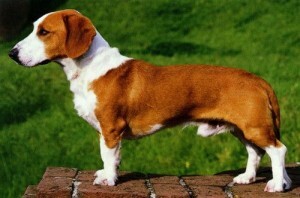 The Westphalian Dachsbracke is another neat German dog. They’re about 15″ tall at the withers, nice and compact. They somewhat resemble the Dachshund, and rightly so, since they achieved their short stature through cross breeding the Bracken with the Dachshund. A scenthound, they were first described as a breed in 1885, so they’ve been around for a good amount of time. Unfortunately, they are rarely seen any more, even in Germany. The only kennel club that recognizes them is the United Kennel Club. Some pretty sweet dog breeds out there. Have you ever met a dog of any of these breeds? OMG we just got a dog we were sure was a mutt, but he is certainly a German hunting terrier!! Thank you so much! Previous PostPrevious Will My Dog Be a Good Therapy Dog?